Dolphins are mammals. Mammals are warm-blooded animals that bear their young live, and nurse them on their mother's milk. So, dolphins are not a fish. There are thirty-three ocean dolphins, five river dolphins, and six different kinds of porpoise. 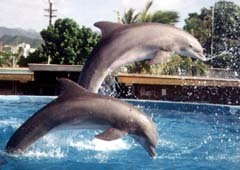 Dolphins use body languages and sound to communicate with each other. Dolphins have to eat a lot of food. They need food energy to keep warm and to swim. But they don't need to eat all the time, because they can store energy in their body fat. They like to eat fish, squid, and jelly-fish. Dolphins need to watch out their enemies all the time because sharks and killer whales eat them. Besides, they hunted or accidentally killed by humans. Because of these reasons, dolphins need to live in group to cooperate with each other in order to survive. Much of their survival depends on their ability to defend themselves. Do you know which are the below dolphins are the biggest ? There are several links that could provide more information about dolphin.